The next meeting is May 13, 8:30 at Charlie's. The next workshop will be November 6th at Charlie's at 8:30. 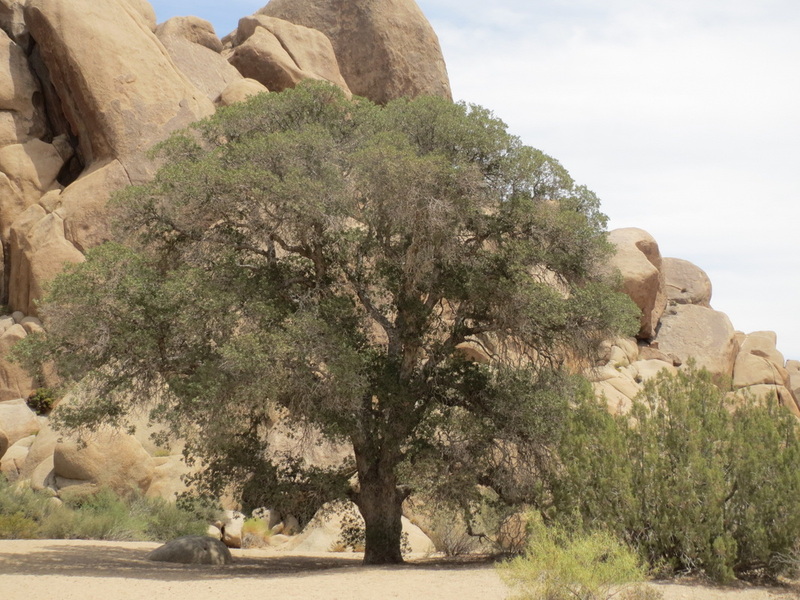 Scrub Oak in Joshua Tree National Park July 2016. Elevation about 3500 feet in Sonoran Desert type area. Nice open structure to see branching. 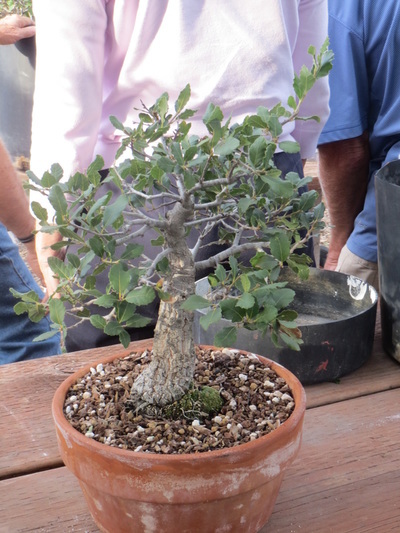 Could almost put this tree, rock and accent plant in a tray or shallow pot. California Juniper to the right. Monzogranite is the big boulder pile in the background. 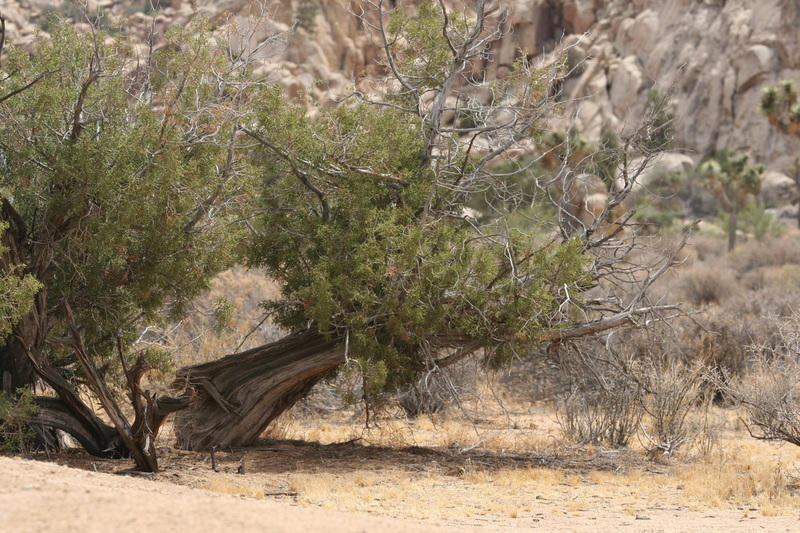 California Juniper is near-by neighbor to the Oak. ​in Sonoran Desert type area. Nice open structure to see branching. ​Monzogranite is the big boulder pile in the background. Google it. 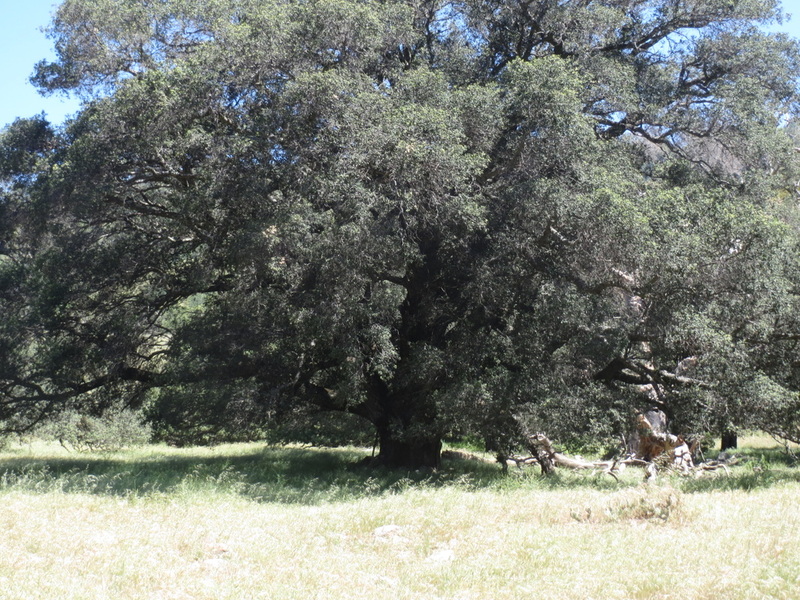 This Oak is recovering from the drought so there is a lot of growth occurring along the branches. One can still see the natural movement of the branches as was taught to us by Al Nelson and John Jackson; directional pruning by nature. The same situation applies here too. The "herky-jerky" movement is more dramatic here. This movement is also seen in our bonsai trees but the "herky-jerky" movement is of course not measured in feet, but in inches and sometimes less than an inch. Since the Oaks in pots with regular feeding and watering grow quickly and continuously, we can see the motion in less than a season on the thin, young branches. However, if the buds are pruned too close together, then with time the "herky-jerky" motion smoothes out to the curvey motion you see in the photo. May 2016: The photos are from the Julian area. 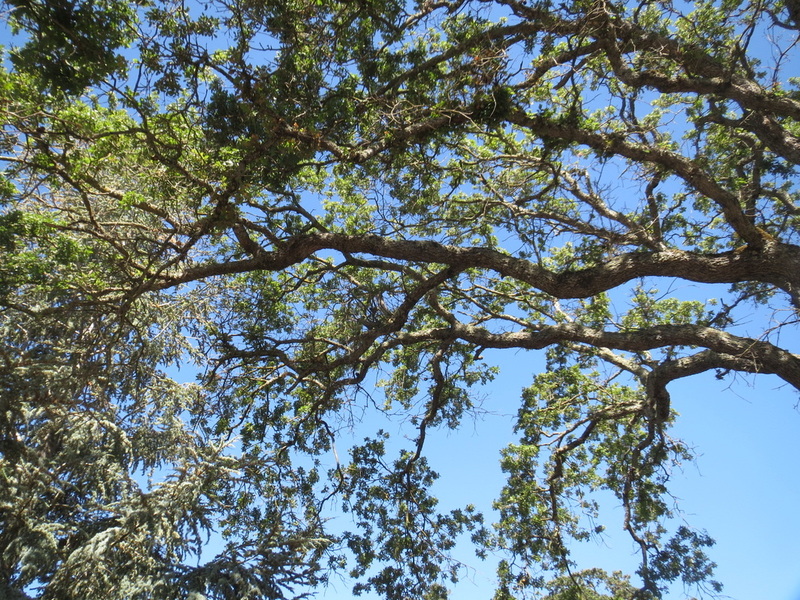 They are Live Oak profiles from far away to close up of branching structure. View top to bottom. The good rains this year have the back country looking very healthy. 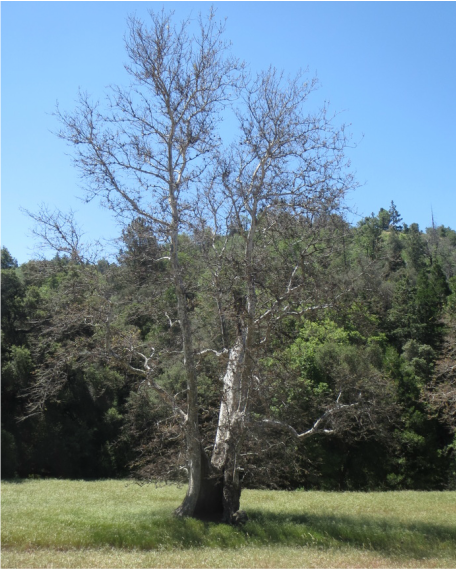 Still oaks and conifers affected by drought, insects and disease, though. 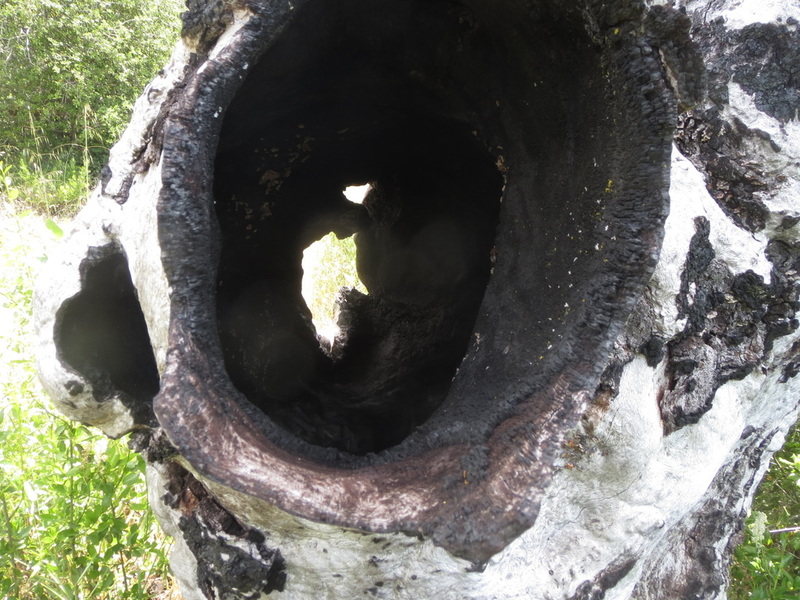 The next photos are of a burned out Oak. Useful for carving guidance. Photos, side-by-side this time, were taken from the same angle; distance and close-up. 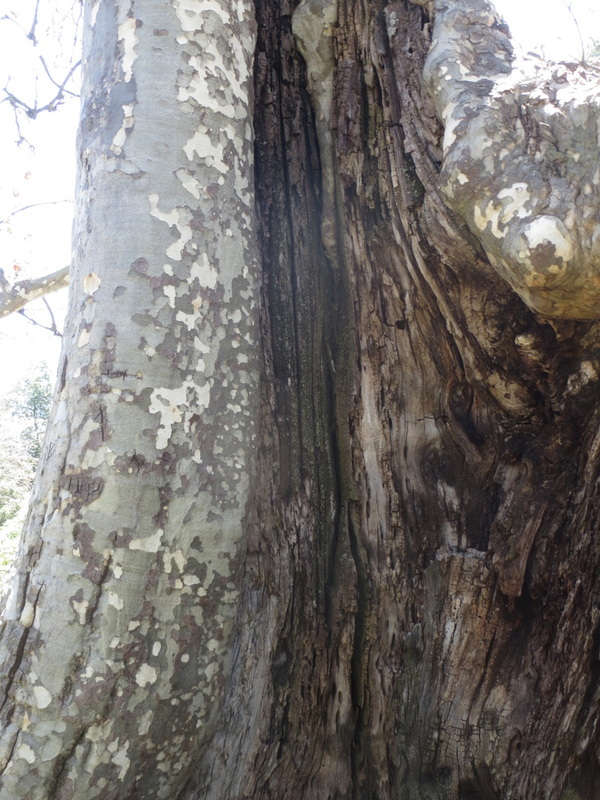 These photos are of a burned Sycamore which recovered from the "minor" wound. Show good detail of weathering for carving. 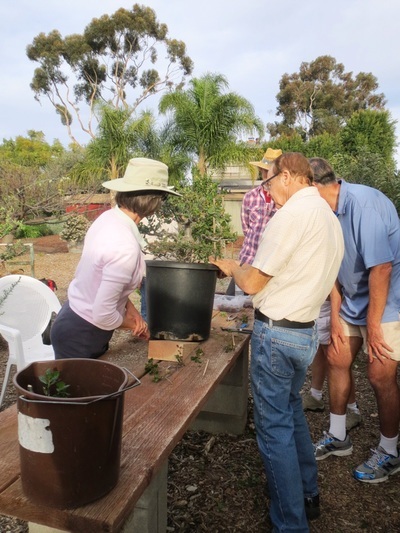 These photos are from the April 3, 2016 workshop. In photo 1 we are all looking at Bob's big bear. Gorgeous and way too happy. But, give John some pruners and time, and the head came off along with many other branches. Lots of branches from which to choose the main branching. 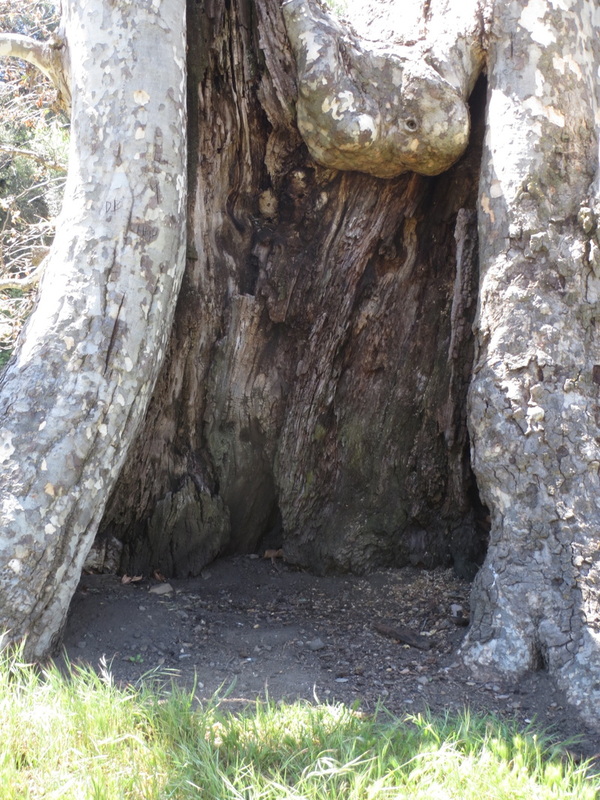 Last photo is the tree after the Atkin's diet. 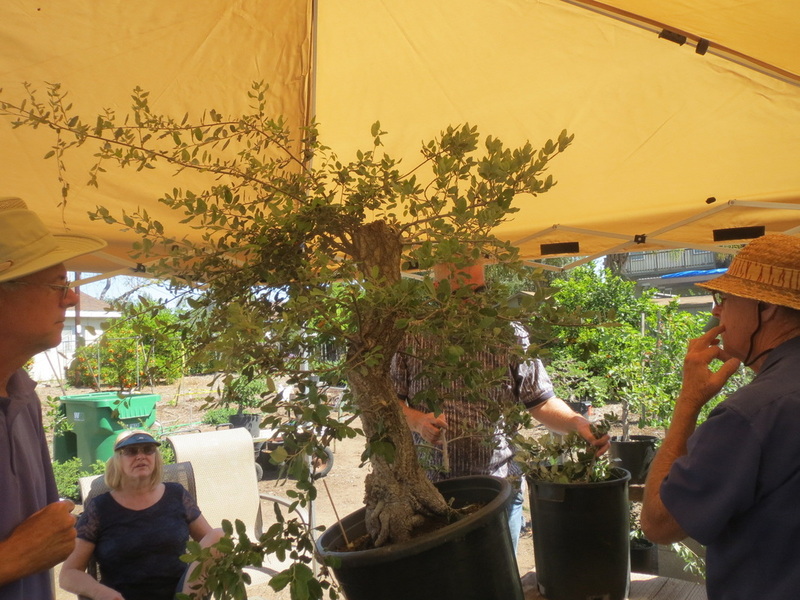 An apex was selected, main branches selected and lots of growing to do. Notice the bad positioning of the tree by the photographer? The straight thing is not the new apex. It is a power pole. Oops. The tree has great taper to just above the soil level. 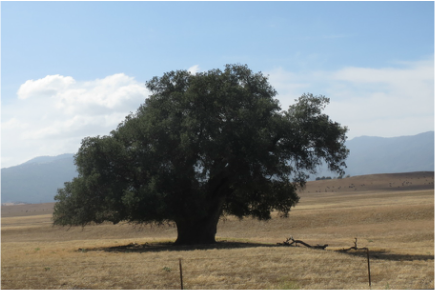 Oaks and Olives are famous for this. Probably wound the base where the reverse taper is and then raise the soil level. 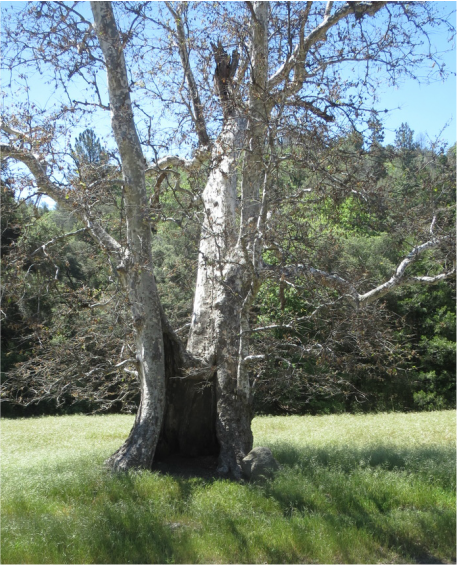 Time will grow more roots which will add to the mass of the base of the tree and its already good taper. Al Nelson's talk at the Sept. meeting: https://www.youtube.com/watch?v=0LioMMw5Rj8. Soil starts at about 20 min +/-, but here it is for quick reference. This may be a good mix for other acid living plants. 20% sifted medium akadama. Al prefers the hard akadama from Dave and June, Ryusen brand "Hard Akadama". It actually is harder than other brands' hard akadama. 20% small orchid bark like fthe bark we get at Walter Anderson's Nursery. 5% sifted potting soil (Al did not say which brand/type). 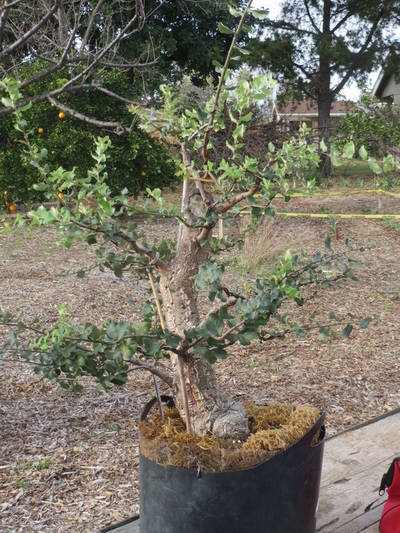 Jumbo akadama for larger oaks, no amount stated. Probably 10%. Use smaller sized akadama as the tree/pot size get smaller. Drainage layer is expanded clay balls from the hydroponics/pot growers store or, large, up to 3/4", lava rock Al bought at Home Depot. 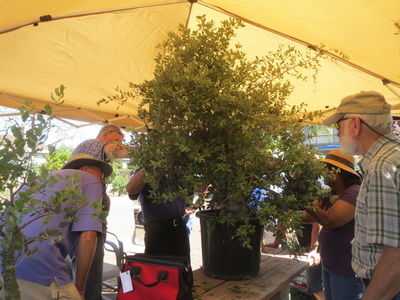 The sizing is probably for the larger trees/pots, use smaller clay balls as tree size goes down. 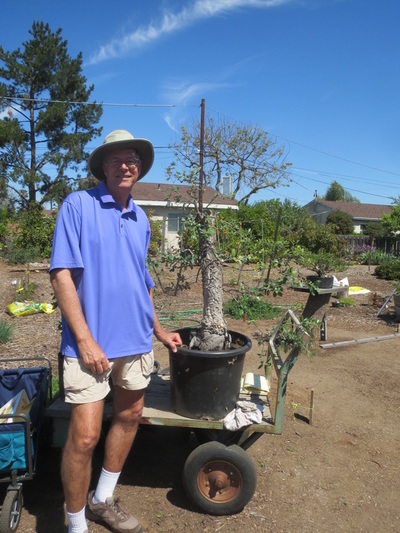 Use fat chop sticks or pointed wood dowels to gently push soil mix down to make good contact with root ball. Al prefers not to wiggle the tool too much so the soil components do not crush, especially the akadama. Water it all in with HB101. Bottom line, Al loves fast drainage. At the Pavilion we use the club mix ratio of 4-4-2. For feeding the video starts talking about fertilizing Oaks at 28 minutes. Al uses several fertilizers: Fish emulsion, Miracid [NOTE they do not call it miracid any longer: Miracle-Gro® Water Soluble Azalea, Camellia, Rhododendron Plant Food, liquid Kelp, phosphite or Agri-phos available at Walter Anderson's, Ammonium phosphate with sulfur. This is a hot fertilizer so be careful and follow the directions. ​At the Safari Park the brand called Espoma, Soil Acidifier, is added periodically. Good acidifier with gypsum and soil sulfur. We will meet 3 times this year. 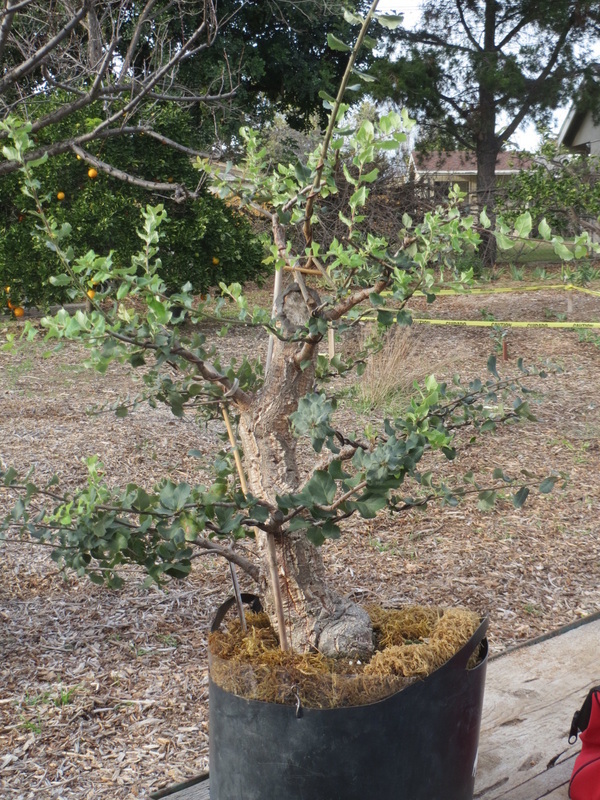 We generally try to anticipate when the trees will begin to grow in the spring for repotting and meet then to see what new buds will develop for styling branch thickness purposes. Watch for the buds turning red, then you know the tree is now active. Then there is the summer to see what happened after the spring growth and to ready the tree for the fall, and lastly in the fall when the last growth spurt is happening. 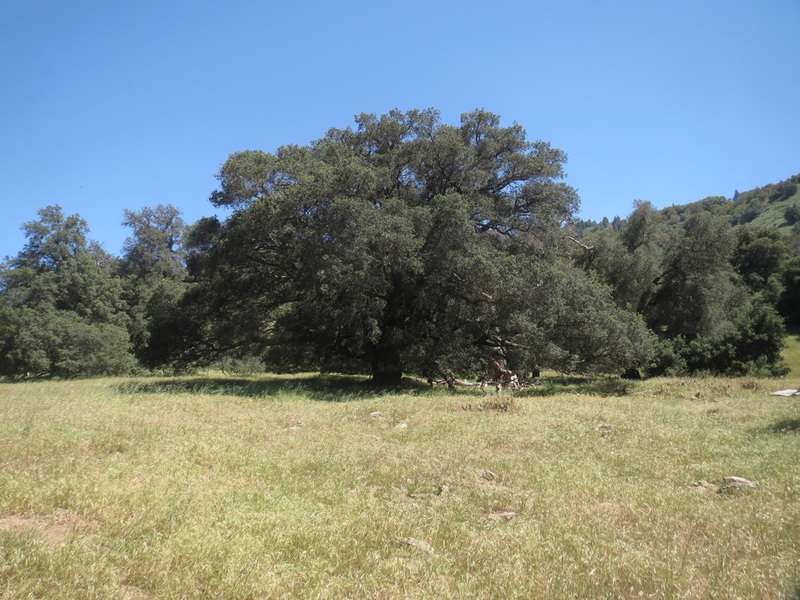 Although, if you feed and water enough, oaks can keep on growing more than in just the spring and fall. 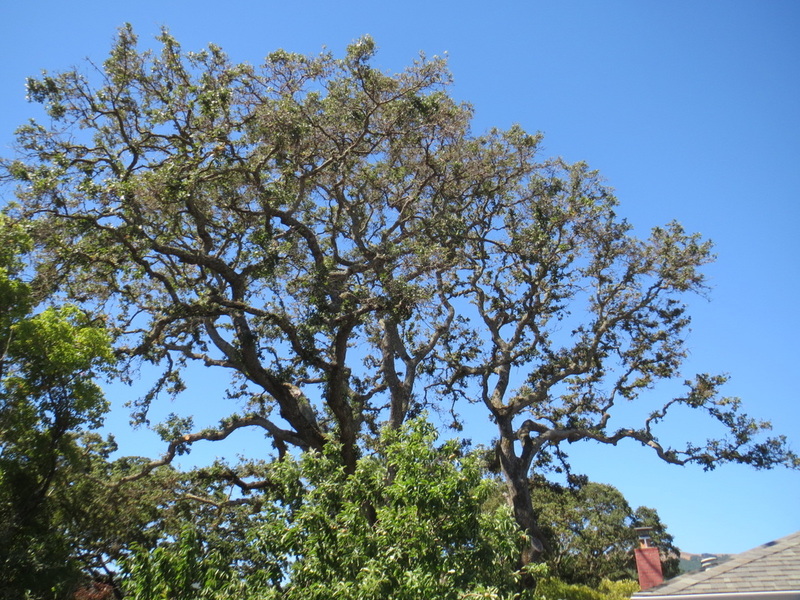 Oaks are being attacked by 3 serious problems. Keep your trees healthy, no stress, and that will help but is not a guarantee to be problem free. See the many links that pop up when you type in, UC Extension Oak Problems into Google (see also the links below). Also, see the SDBC video on Oaks with Al Nelson and what he says about supplemental application of a high phosphorous product called Agri-Fos and how it helps. Agri-Fos is available at Walter Andersen Nursery or on-line.